About Us | Widespread Industrial Supplies, Inc. 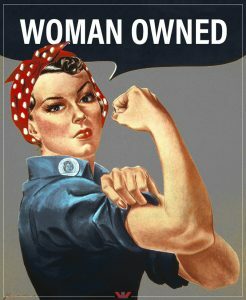 Widespread Industrial Supplies, Inc. is a woman-owned, certified small local business enterprise that has been committed to serving the industrial and MRO fields since 2002. We are a full line industrial supply company, specializing in fasteners, cutting tools, electrical, welding, chemical and safety related supplies, as well as hand and power tools. Through dedication to customer service and product availability, Widespread Industrial Supplies, Inc. has built a comprehensive customer database, ranging from machine shops to oil refineries throughout the country. We take pride in our extensive knowledge of all fastener related items, including the various alloy steels and exotic stainless steels on the market. We handle all of your difficult fastener inquiries by doing the hunting for you. You will no longer need to waste countless hours searching for that hard to find fastener, tool or miscellaneous part. A simple phone call, fax or email with the product description is enough for us. We have relationships with more than 100 fastener distributors and manufacturers from all over the world. Our mission is simple: If it is made, we will find it. If it can’t be found, we will make it. Widespread Industrial Supplies, Inc. makes every order a priority. We are available 24 hours a day, seven days a week for all order inquiries. With no minimum order charge and quick turnaround of shipments, you can rest assured that you and your customer will receive your order on time, minimizing costly equipment and project downtime. We are at your disposal for your everyday MRO needs and look forward to being your one-stop industrial supplier. 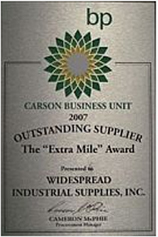 Recipient of the prestigious “Extra Mile” Award presented in 2007 by British Petroleum for being recognized as an outstanding supplier to the Carson Business Unit.